This tutorial is for educational purposes only and should not be used for any illegal activities. I’M NOT RESPONSIBLE IF YOU CAUSE ANY DAMAGE OR MISUSE IT. Don’t INTRUDE into someone’s privacy. 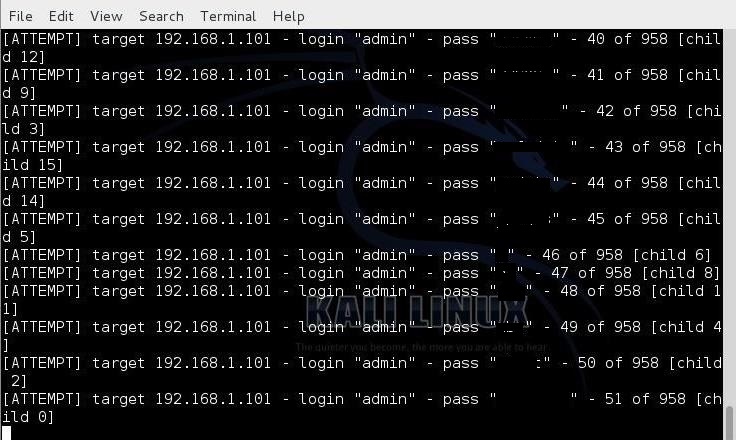 Fire up Kali and open THC-Hydra from Applications -> Kali Linux -> Password Attacks -> Online Attacks -> hydra. We can identify each of these using a proxy, such as Tamper Data or Burp Suite. It is also recommended to use Tamper Data, but in this tutorial, we will be using Burp Suite. 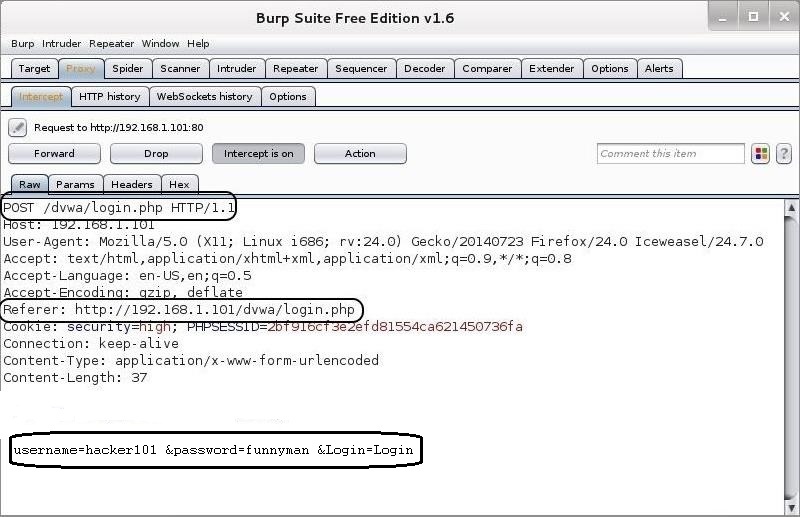 You can open Burp Suite by going to Applications -> Kali Linux -> Web Applications -> Web Application Proxies -> Burp Suite. When you do, you should see the opening screen like the one below. 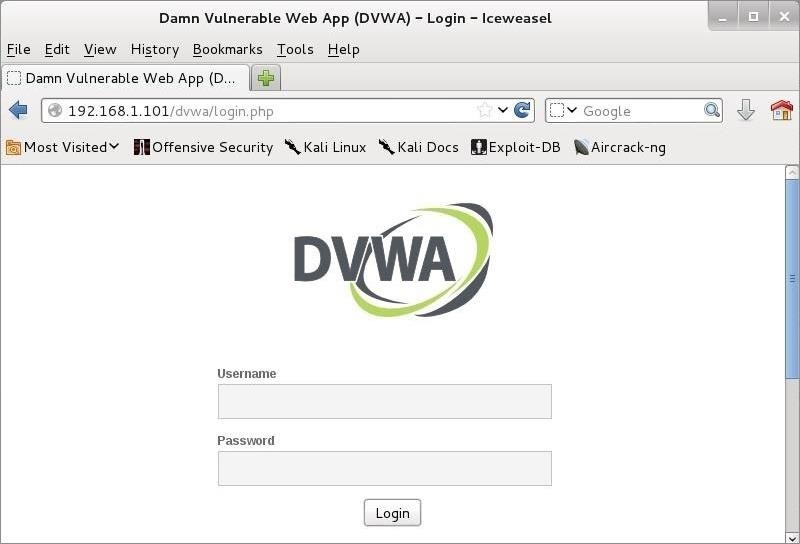 Now, we will be attempting to crack the password on the Damn Vulnerable Web Application (DVWA) (A Safe Testing environment). You can run it from the Metasploitable operating system (OS to Run Metasploit) here, and then connect to its login page, as I have here. Finally, we need to configure our IceWeasel web browser to use a proxy. We can do that by going to Edit -> Preferences -> Advanced -> Network -> Settings to open the Connection Settings, as seen below. There, configure IceWeasel to use 127.0.0.1 port 8080 as a proxy by typing in 127.0.0.1 in the HTTP Proxy field, 8080 in the Port field, and delete any information in the No Proxy for field at the bottom. Also, select the “Use this proxy server for all protocols” button. Step 4: Getting the wrong response. Now, let’s try to log in with my username “hacker101” and password “funnyman.” When doing that, the Burp Suite intercepts the request and shows us the key fields needed for a THC-Hydra web form crack. After collecting the required information, I then forward the request from Burp Suite by hitting the “Forward” button to the far left. The DVWA returns a message that the “Login failed.” Now, I have all the information I need to configure THC-Hydra to crack this web app. Getting the failure message is key to getting THC-Hydra to work on web forms. In this case, it is a text-based message, but it won’t always be. At times, it may be a cookie, but the critical part is finding out how the application communicates a failed login. In this way, we can tell THC-Hydra to keep trying different passwords; it’s only when that message does not appear that we have succeeded. NOTE: If you use the upper case “L,” then you are using a username list, and if lower case “l,” then you are trying to crack one username that you supply there. In this case, I will be using the lower case “l,” as I will only be trying to crack the “admin” password. Now, let’s crack this web form login. Step 6: Choose a Wordlist. Step 7: Creating the Command. Step 8: Fire Up Hydra!!! Fire it up! Since we used the -V switch, THC-Hydra will show us every attempt. After a few minutes, Hydra returns with the password for our web application. AutoFocus 2.0.3 Release Documentation is Now Live!